416 customers have given this product a 5-star rating. Of these, 382 customers have written no texts or given their feedback in another language. 95 customers have given this product a 4-star rating. I very much like the Dunlop Jazz III's and even more like the Max Grip-version. It does make a difference. The Dunlop Jazz III's makes for good picking, soloing and rhythm guitar-ing. The sturdy, yet thin, pleasantly small and pointy plectrum ensures that you have nice control over what you do on your guitar. This grip-version makes it less unlikely that you drop the pick while playing. Which is nice, especially during a gig. These were bought for my son, to help him with his musical requirements. He has used them before and been very pleased, so going for another batch was a no-brainer. 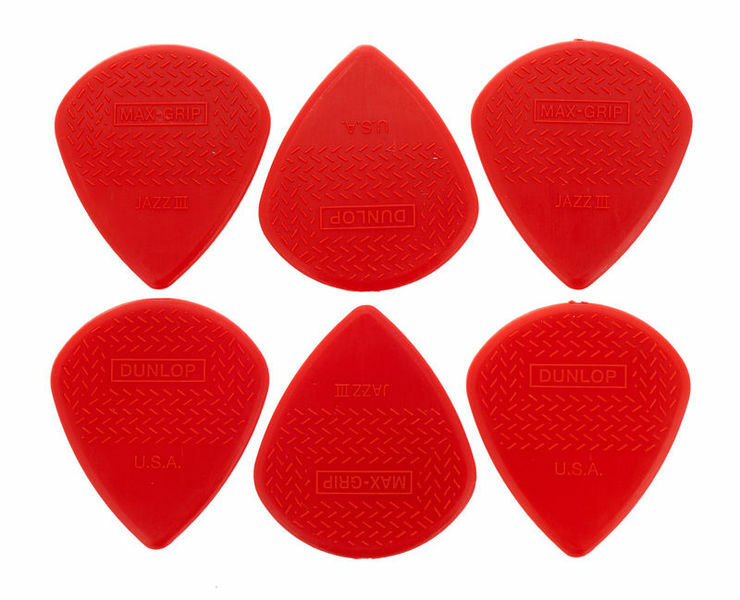 These are the standard, extra-grip picks, which will give a slightly different tone from the carbon fiber type. There is a standard version available from Thomann. I believe there is a version which does not have the extra "grip" - don't buy those, buy these, unless you have a good reason to do otherwise. I played guitar for nearly thirty years, before I switched to bass, and I was always dropping my pick. This design gives the player a better chance of holding onto his plectrum, particularly if his hands are cold. I still play guitar on recordings, sometimes, and I find that these stay in the hand automatically. The grips will wear down in time! But I don't consider this a downside, simply because it's to be expected. My son will generally select a new, or nearly new pick for a gig, or a recording session. The life of the grip could possibly be extended by gently scrubbing the pick with a wet nailbrush because dead skin, trapped inside the grip, will exacerbate wear by reducing the grip available. ID: 242900 © 1996–2019 Thomann GmbH Thomann loves you, because you rock!